I’ve had the opportunity recently to work on several marketing projects related to one of the industries I am most passionate about – sport. Or specifically, and even more passionately, FOOTBALL! 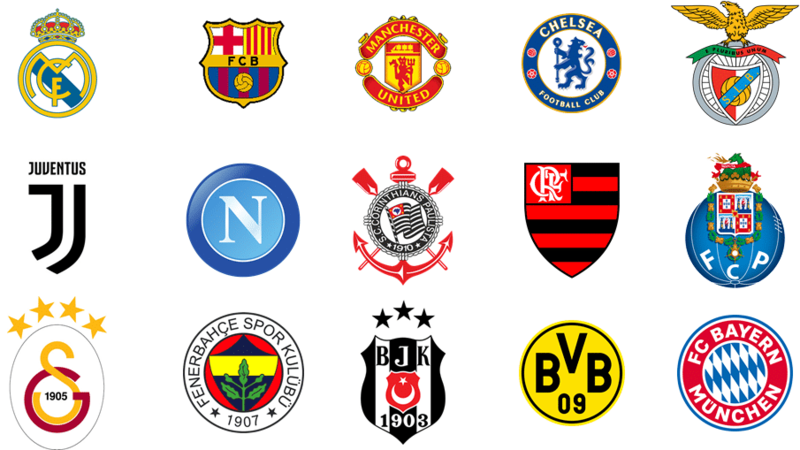 Working with clubs in Italy, Brazil, Turkey, and other countries around the world, I learned that they all agree with the conventional wisdom that the financial results of a football club are directly linked to its performance on the pitch. The more a football team wins, the more people will engage with the club, i.e., visit the stadium, buy T-shirts and other merchandise, and even travel to away matches. Perhaps more importantly, as the wins keep coming, the easier it is to find sponsors and earn revenue from TV rights, so all the club’s assets increase in value. Kind of obvious, right? 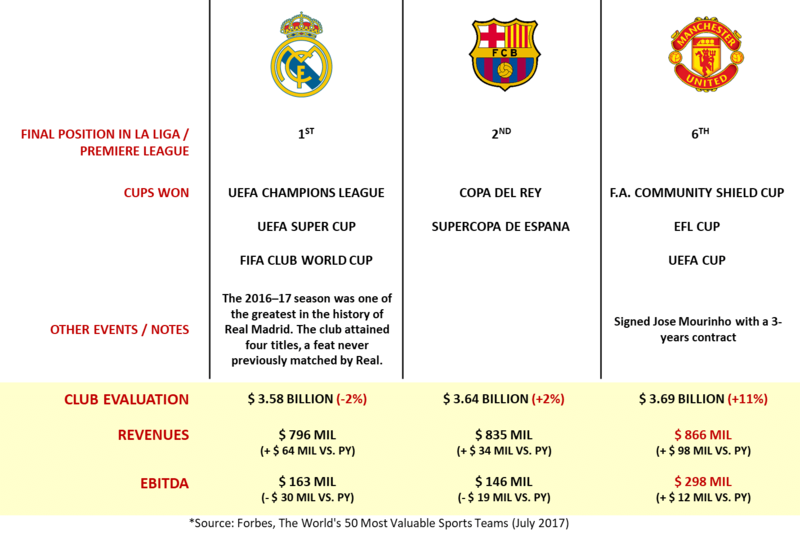 Luca compared the sports results of 2016/2017 of three very important football clubs in Europe (Real Madrid, Barcelona, and Manchester United) with their financial results (in particular Club Evaluation, Revenues, and EBITDA (Earnings Before Interest, Taxes, Depreciation, and Amortization). Despite 2016/2017 being one of their best years ever in terms of sports results (Spanish League, UEFA Champions League, UEFA Super Cup, FIFA World Cup), their financial results were not so successful. According to Forbes, the Club Evaluation at the end of the season was US$3.58 billion, 2% less than the previous year. EBITDA was down US$30 million compared to the previous year. Although Barcelona didn’t win as much as Real Madrid, the 2016/2017 season was still a relatively good one for them (they won Copa del Rey and Supercopa de España, and were runners-up in the Spanish League). Yet their financial results were less than impressive, especially considering that, unlike the other two teams, Barcelona include capital gains from the sale of players directly in their balance sheet. The Club Evaluation grew only 2%, while EBITDA closed at US$19 million lower than the previous year. For Manchester United, 2016/2017 was, to say the least, not one of their best seasons in terms of on-the-pitch results. The Red Devils placed sixth in the Premier League and won relatively minor trophies: the UEFA Cup, the FA Community Shield Cup, and the EFL Cup. However, their financial results were impressive. The Club Evaluation grew 11%, making it the world’s most valuable soccer club of 2017 with EBITDA US$12 million higher than the previous year. This analysis, comparing on-the-pitch results with financial performance, shows that sometimes winning is not the only leverage that football clubs have to increase their financial value. From a marketing perspective, a football club should not be seen as any different from any other brand, just like Coca-Cola, Apple, Volvo, or Chanel. Just as it isn’t only about how well Coca-Cola quenches your thirst or how fast Apple’s processing speed is, it’s also about how a brand makes you feel emotionally as well as how it performs functionally. In any industry, successful brands are those that portray a certain lifestyle people can relate to and engage with on a deeper emotional level. Thus, the key is to move from being just a FOOTBALL CLUB to becoming a LIFESTYLE that consumers can emotionally embrace. To do so, it becomes essential to understand the kind of values the football club wants to stand for and consequently, what they need to communicate to their fans to promote and encourage that lifestyle choice. 1. The sense of belonging is more aspirational and emotionally engaging for the consumer/fan. 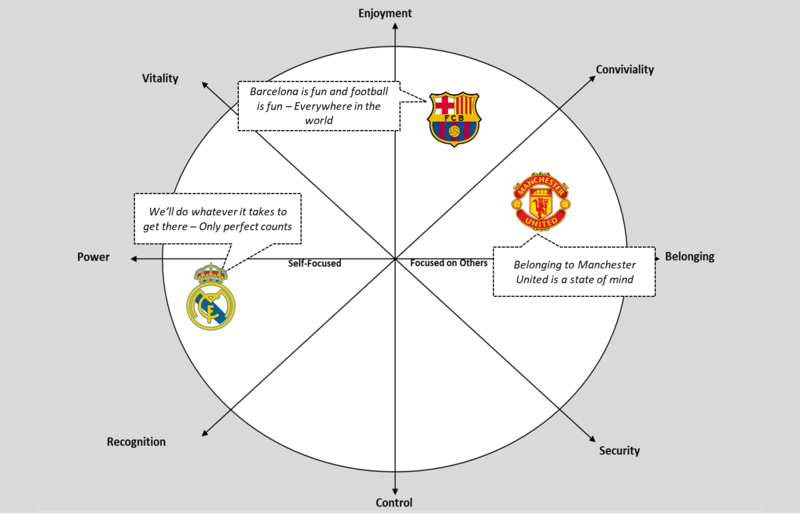 Great brands create a sense of ownership by the consumer and Manchester United makes them the center of the experience. 2. One of the consequences of developing a strong sense of belonging is that during the hardest times (when results are not forthcoming) fans band together and become even more supportive. Together we share everything: the joy, and the pain. Manchester United’s management understands that portraying an involving lifestyle that allows the fan to stand for a unique and crucial emotional experience can have a much stronger impact on the club’s financial results than their on-the-pitch performance. Not surprisingly, a question that frequently comes up during my meetings with different football clubs is: How well do we know our fans? Knowing how often they go to the stadium, where and how often they watch the matches they don’t attend, and how many merchandising items they buy every year is simply not enough to build an effective positioning strategy. Football clubs need to understand their fans as complete human beings in order to determine their needs, their hopes, and their fears in the broader context of their lives and then release these with their football brand. Once we understand them as full human beings, we can create tailor-made strategies and activities that engage fans on a deeper emotional level. Once we have identified the key target groups to focus on, we need to prioritize the key touch points to activate, those that are most relevant for the target groups, where they will be more open to the message we want to deliver. 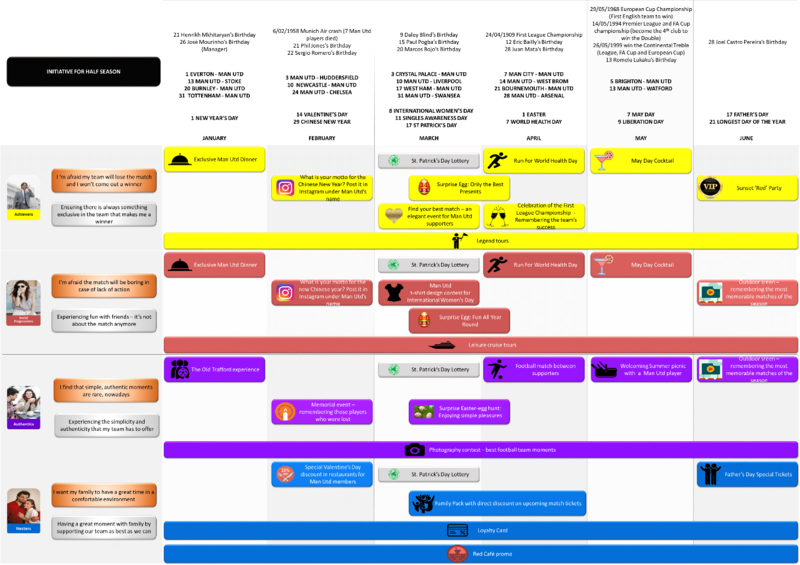 Some of the inputs which can be used as inspiration could be the solar calendar, the football calendar, and some key historical dates of the specific team. - The solar calendar indicates all holidays and observances in a country for the year (e.g. Valentine’s Day, Easter, Father’s Day). This will give us the opportunity to create meaningful activities for the specific target related to a specific time of the year and link it with the football club. - The football calendar notes all the important matches for the season. This is key (due to the high seasonality of this category) to be able to define which dates could be activated in an impactful way. - Additional key historical dates related to the football club such as players’ birthdays, anniversaries, historic wins, etc., can also be used. This matrix shows an example of key initiatives related to different target groups during the second half of the season according to some of the key events. This Red event (red due to the name by which Man Utd is known – The Red Devils) is an exclusive party with a specific dress code: everyone must come dressed elegantly and with a red accessory (e.g. a red tie, a red hat). It happens in June in accordance with the longest day of the year (solar calendar), allowing a long, fancy, enjoyable sunset. Achievers are very competitive; they like to be the best and feel part of the elite. Thus, an exclusive party, to which a limited number of people are invited is something that can make them feel special and unique, and therefore release their main tension point. The matrix follows the same logic for the different targets and creates the perfect experience for each one by taking into consideration their category needs and the combination of the three different inputs mentioned. In conclusion, a human-centric marketing approach, will help a club to move from being just a football club to becoming a lifestyle brand. 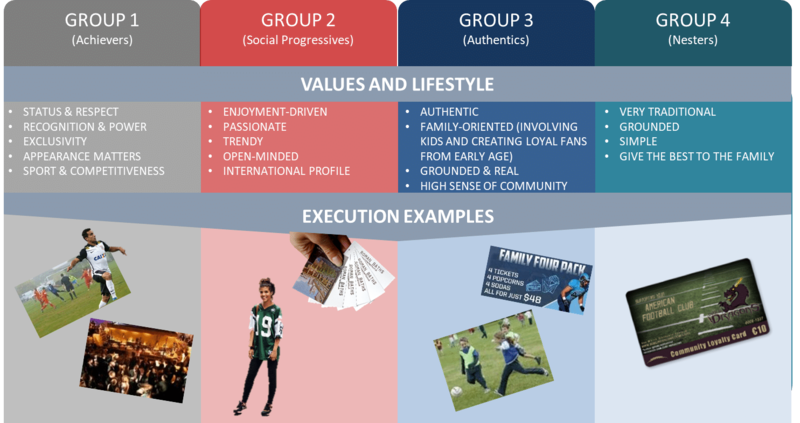 By understanding the fans as complete human beings living full and complicated lives, we will be able to create more emotionally engaging brand strategies and activities that will impact the bottom line, as well as increase the equity of the club over the long term, despite the inevitable ups and downs that can occur throughout the season with on-pitch performance. - GAIN INDEPENDENCY FROM SPORTS RESULTS. As the example shows, some football clubs over-perform financially, despite results on the pitch. - GAIN INDEPENDENCY FROM THE CATEGORY. Successful football clubs will manage to move from the sports category to other categories (like fashion, entertainment, social environment, and many others). It will not just be about football anymore. - INCREASE PENETRATION BY ATTRACTING NEW FANS. Successful football clubs will be able to attract to their “world” people who are not solely interested in football in the traditional sense of being a fan. They will follow the team for the values it represents. - INCREASE CONVERSION AND PROFITABILITY. Such an approach will convert fans to actual buyers in terms of tickets for the matches and all the relevant merchandising that helps to create the brand experience (T-shirts, cups, hats, and so on). Furthermore, the profitability will increase because people are willing to pay more when they are emotionally engaged with a brand. - DON’T WORRY ABOUT KNOWING THE COMPETITION. Worry about how well you know your fans. During my last trip to Brazil, I was talking with the senior management of one of the most important teams in the country and they shared with me a very important insight. Brazilian football is losing its local relevance. Kids grow up cheering for PSG, Barcelona, or Real Madrid because their favorite Brazilian players play there. A football club portraying a more locally relevant lifestyle will increase engagement with kids, who are the future of the game, and therefore make local and national football teams more emotionally meaningful. - INCREASE THE LOYALTY OF THE PLAYERS. With this I am not trying to say that money won’t be relevant anymore, but playing for a team that portrays certain values and beliefs will increase the sense of pride and attachment the players have to the club. 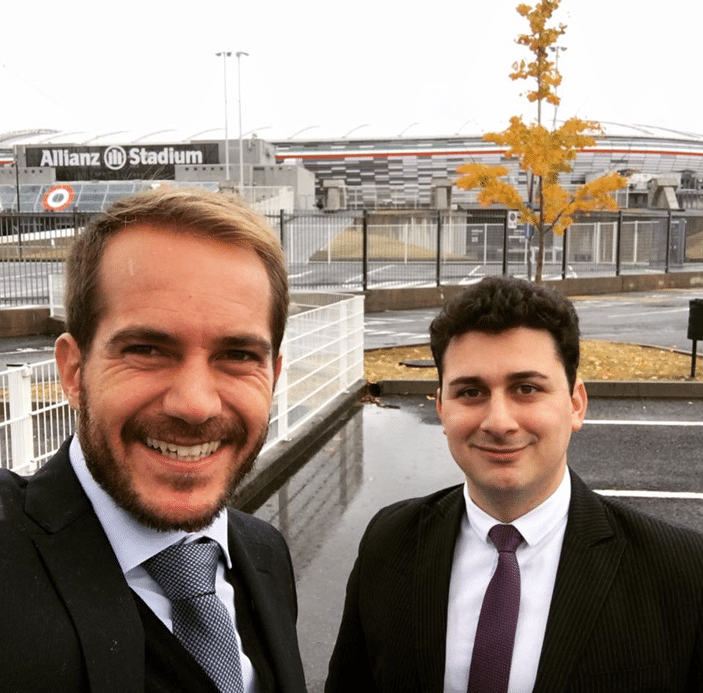 In the picture Rinaldi (M) with Bertocci (L) – Partners at Garrison Group.